Fits exponential beta curves to 13C breath test series data using a mixed-model population approach. See https://menne-biomed.de/blog/breath-test-stan for a comparison between single curve, mixed-model population and Bayesian methods. Data frame or tibble as created by cleanup_data, with mandatory columns patient_id, group, minute and pdr. It is recommended to run all data through cleanup_data to insert dummy columns for patient_id and group if the data are distinct, and report an error if not. At least 2 records are required for a population fit, but 10 or more are recommended to obtain a stable result. Dose of acetate or octanoate. Currently, only one common dose for all records is supported. 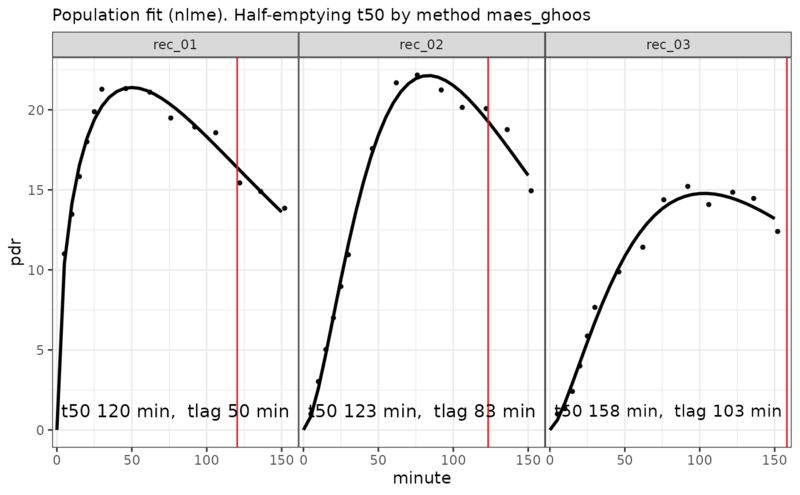 The dose only affects parameter m of the fit; all important t50-parameters are unaffected by the dose. Optional start values. In most case, the default values are good enough to achieve convergence, but slightly different values for beta (between 1 and 2.5) can save a non-convergent run. When the mean sampling interval is < sampleMinutes, data are subsampled using a spline algorithm by function subsample_data. See the graphical output of plot.breathtestfit for an example where too densely sampled data of one patients were subsampled for the fit. Estimated parameters in a key-value format with columns patient_id, group, parameter, stat, method and value. Parameter stat currently always has value "estimate". Confidence intervals will be added later, so do not take for granted that all parameters are estimates. Has an attribute AIC which can be retrieved by the S3-function AIC. The data effectively fitted. If points are to closely sampled in the input, e.g. with BreathId devices, data are subsampled before fitting. Base methods coef, plot, print; methods from package broom: tidy, augment. #>  5 rec_01     A     t50       maes_ghoos               120.